When we age, we often develop emotional, mental, and physical disorders that can’t always be remedied with traditional medicines. Some seniors may prefer holistic medications, while others will look to programs like music therapy. If you’re curious about the health benefits of music therapy for seniors, Oshkosh caregivers will explain several advantages of this alternative treatment. In a study by Dr. Jean Tang at Seattle University, results revealed that seniors could greatly lower their blood pressure by listening to certain types of music three times a day. Music specifically designed to promote relaxation had the highest benefit, but classical music by Mozart also significantly lowered blood pressure. As people lose cognitive function, music is one of the things the brain remembers longest. Dr. Paul Williams at the University of Toronto conducted a study that showed caregivers found it significantly easier to help seniors with dementia when they listen to their favorite music. Seniors receiving dementia home care in Oshkosh can perform daily tasks better and deal with change easier if caregivers play tunes that seniors have always liked. Music is known to boost memory, so it stands to reason that it helps unlock old memories for seniors with Alzheimer’s. It also turns out that the memory-improving effects of music help seniors with Alzheimer’s to retain new information. Professor Brandon Ally from Boston University found that people with Alzheimer’s can remember and learn new things if the information is presented as a song. For seniors with arthritis or other diseases that result in painful bones and joints, listening to music can be quite beneficial. The small finger and arm movements required to play music are gentle enough to avoid pain, but they are enough to stretch and work joints while increasing mobility, flexibility, and fine motor skills. Data analysis discovered by researchers from the Barts Health NHS Trust shows that music could soothe both physical and emotional pain. While recovering from an operation, a senior may not be able to take pain or antianxiety medications due to side effects. Any type of music that the senior enjoys can calm them and reduce pain perception. 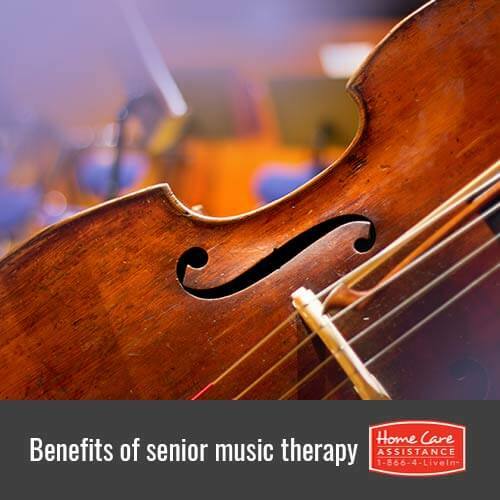 Treatments like music therapy provide numerous health benefits for seniors in terms of physical, emotional, and cognitive disorders. To supplement your loved one’s music therapy treatments, turn to Home Care Assistance of Oshkosh. We provide comprehensive home care seniors can rely on no matter what their individual needs require. Our trusted caregivers offer transportation to and from therapy sessions, help with nutritious meal preparation, diligent medication reminders, and more to help seniors age in place with dignity. Get your loved one the care he or she needs today when you call (920) 710-2273 and schedule a free consultation with a friendly Care Manager.